Youngstown, Ohio - The Youngstown State women's soccer team fell to Buffalo by a score of 3-0 on Friday night from Farmers National Bank Field in the Covelli Sports Complex. The Penguins fall to 0-2-1 while the Bulls improve to 1-1-0. 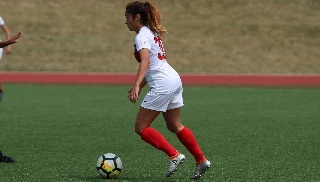 After a scoreless first half, Buffalo got the scoring started in the 67th minute when Gurjeena Jandu scored on a free kick to give the Bulls a 1-0 lead. Buffalo extended their lead in the 79th minute on a goal from Gianna Yurchak, which was assisted by Carissima Cutrona and Tess Ford. The Bulls pushed their lead to 3-0 in the 88th minute on a header from Kaitlyn Walsh. The Penguins registered 14 shots and eight shots on goal but Buffalo's goalkeeper Emily Kelly denied YSU from scoring. Youngstown State is back in action on Sunday, Aug. 26 at 1 p.m. when they host Canisius.